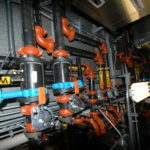 Boston College had an operational 140 Ton Industrial ammonia refrigeration system that served the single NCAA Division 1 hockey sheet with refrigerated glycol. 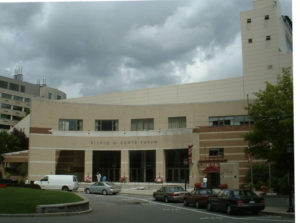 The Conte Forum has 7800 seats and was installed without any dehumidification systems. Rental dehumidifiers were installed from September through January to keep the room clear of humidity and fogged glass. This however presented a large load on the ice that surpassed the refrigeration system capacity. The ammonia system was required to be lowered to supply 6*F glycol in attempts of fly wheeling through resurfacings of the third period. To further complicate things Boston Fire Department was displeased with the ammonia and the air dispersion for reliefs. A few minor releases and leaks had placed Boston College under a microscope. 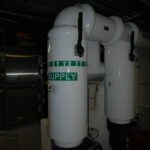 The system also contained a large charge as dual evaporative condensers were located on a roof forty-five feet above the refrigeration room with ammonia interconnecting piping. This piping traveled through portions of this large heavily populated arena. 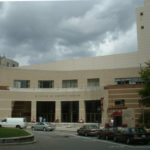 Boston Fire Department after an incident gave Boston College and ultimatum to remove the ammonia immediately. Finally, due to a convocation mass for incoming freshman the ice floor was required to be at temperature in under a ten-hour period (pull down from 70*F to 15*F). This condition was required to build adequate time into the ice managements’ time so they would have time to make and paint ice to get ready to commence the hockey season. Cannon Design, a local engineering firm out of Boston, worked with Emerald Environmental Technologies to use the ice3 Cube modular design to overcome the myriad of hurdles. 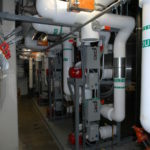 A major hurdle included upgrading the system to 200TR but in a refrigeration room with limited height and the inability to put the increased weight of glycol fluid coolers on the existing roof structure. The final design was completed in June and ten weeks later, the construction schedule was put in place. The almost impossible was required. Ten Emerald Environmental Technologies ice3 Cubes were designed for the project as well as increasing cold floor flow rate to 1600 USGPM. The ice3 Cubes were installed in a two tier custom stands to allow for height. A growth potential for up to twelve ice3 Cubes were allowed for in the infrastructure. A complete Digital Control package was installed to allow for temperature swings common between an empty arena to a capacity crowd. By doing so utility costs could be closely monitored and dramatically reduced. 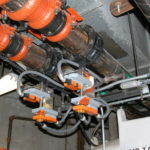 The installation was a building block design allowing for future reclaim heat as well as the ability to use the ice3 Cubes to augment for air conditioning that could be employed at a future date if needed. New lighter staged cooling towers were installed on the roof and new piping was routed to the indoor sump tank and water pumps. 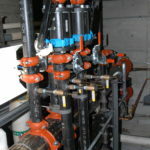 A new plate and frame heat exchanger was installed to allow ice3 Cube waste heat to be rejected to the water cooling towers. The increased floor pump size allowed for a complete glycol exchange rate in two minutes or less, offsetting the large heat load in the room at crowd capacity and maximum dehumidification. 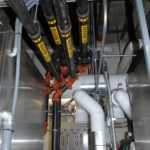 The new warm glycol pumps exchanged heat on the opposite side of the heat exchanger and the Cubes. Infrared ice controllers would now provide system staging based on the surface of the ice temperature. 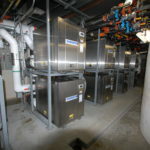 The estimated schedule was met and an active test was set into place requiring Boston College’s new ice3 Cube System to pull down the floor slab temperature from 70*F to 20*F within the ten-hour timespan they had requested. The initial pulldown was a success and was completed an hour faster than projected. 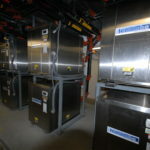 The benefits of a modular ice3 Cube System for Boston College was each Cube contained less than 20 pounds of refrigerant allowing the refrigeration room to be reclassified as a mechanical room removing any requirements for alarming or special construction. 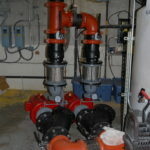 Being a modular design variable frequency drives slowed pumps and reduced operating horsepower during a practice mode and what was deemed as a low occupancy mode. This allowed for an $80,000 incentive rebate from the utility for this seasonal arena and satisfied the Boston Fire Departments original concerns. 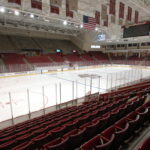 During the very first home game Boston College facilities personnel saw the ice3 Cubes generate a 10*F glycol and cycle off as designed. 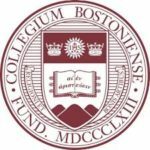 This made the Boston College ice management extremely nervous as they thought they would lose the flywheel that experience had taught them they needed. Ice setup time was checked and determined to be right on target. In the end, we actually increased the glycol temperature to 12*F during games for optimal operation. 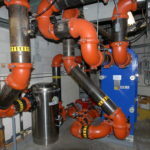 The days of requiring extremely cold glycol to flywheel through to the third period are gone. There were initial naysayers among the operations staff during the preliminary planning stages. Those same individuals have been kind enough to say in the end that they were wrong, and that the ice3 Cubes operate like sewing machines…quietly and efficiently.